Are you working on your course for next semester? Save yourself an annual headache by rethinking how you post when items are due in your Blackboard course(s). In order to provide our students with “at your fingertips” contextual information, we have often posted assignment/activity due dates directly in the assignment/activity descriptions or unit introductions. While this may be beneficial to our students, it provides more whack-a-moles for us to go after when it is time to get our courses ready. In other words, we spend more time updating due dates than making other important changes for the new semester. Blackboard already provides a great way to let students know when an assignment/activity is due with the Due Date checkbox. Not only does the due date show up when the students look at the assignment/activity, it also has the added benefit of notifying the students via email, dashboard and mobile app a week prior to the due date. When placing due dates in unit introductions or assignment/activity descriptions use the due DAY not the due DATE. Our due days will change much less often than our due dates. …the discussion activity for week 1 is due Thursday by midnight. 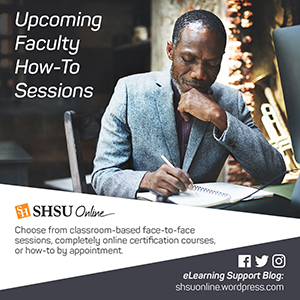 This practice will provide students with the “at your fingertips” contextual information they desire, as well as creating a more efficient method for ensuring your course is ready for the next semester. Both of these Blackboard tools keep you from searching through your entire course to change due dates. So remember, cut down on the some of the stress of getting your course(s) ready for a new semester by using Blackboard’s Due Date feature and use the #DayNotDate when writing assignment/activity instructions and unit introductions.